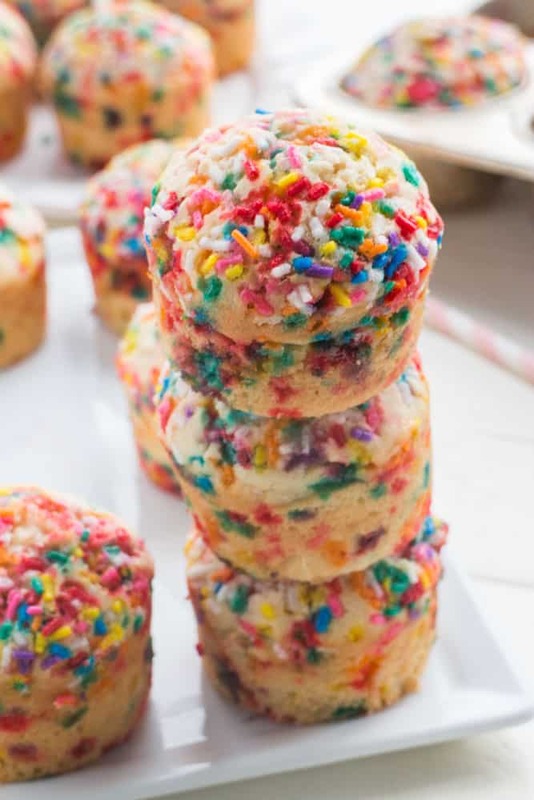 Fluffy, SPRINKLE BIRTHDAY CAKE Muffins that taste just like birthday cake! 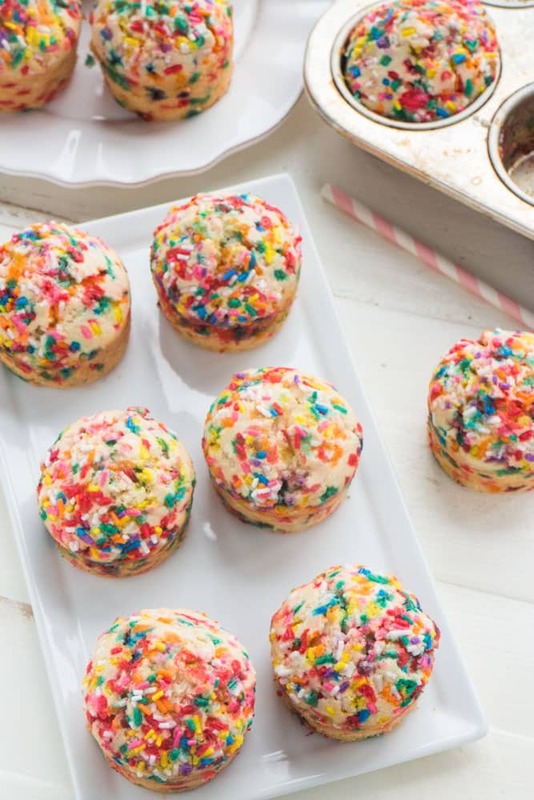 This is a easy rainbow muffins recipe that is pretty and perfect for happy birthday parties and desserts! 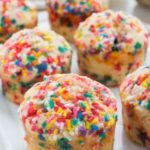 Kids LOVE these FUN muffins! 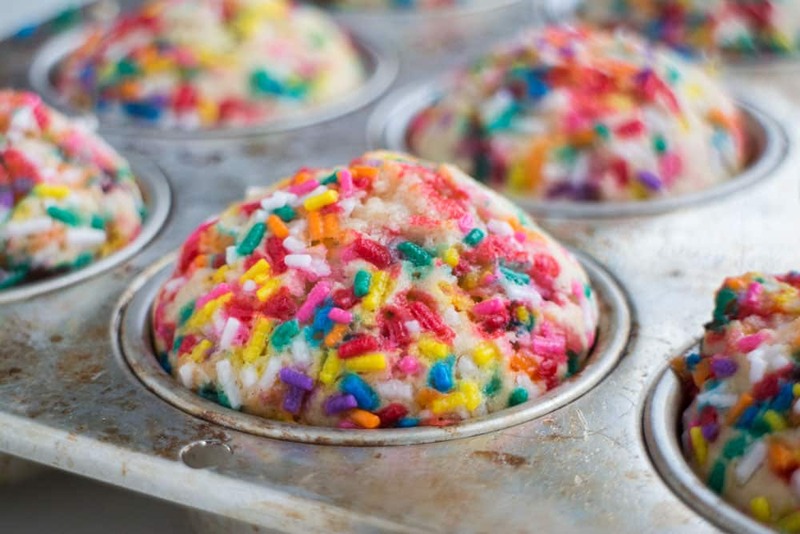 Sprinkles and bright colors make everything funner, that’s why I love baking with them! 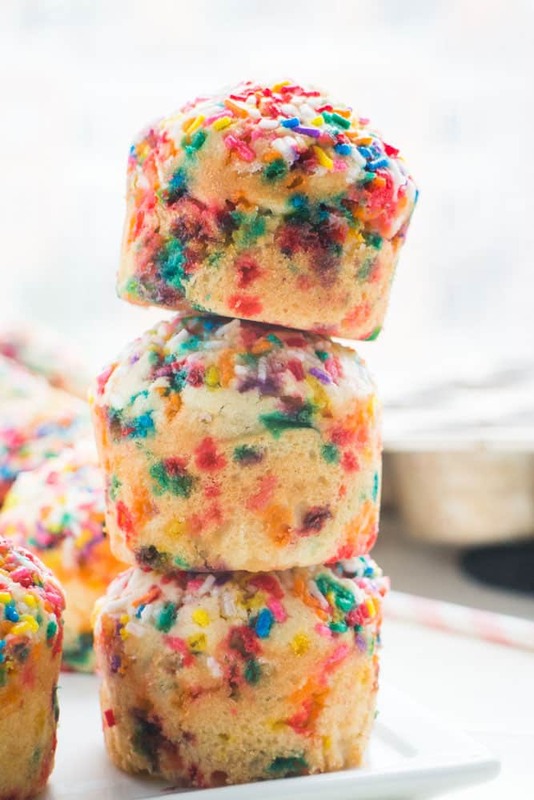 Rainbow Birthday Waffles, Sprinkled Butter Cookies, Confetti Cake Batter Brownies, and White Chocolate Toffee Recipe are some of my favorite colorful treats but now we’re adding a new member to the sprinkle family – Fluffy Birthday Cake Muffins! 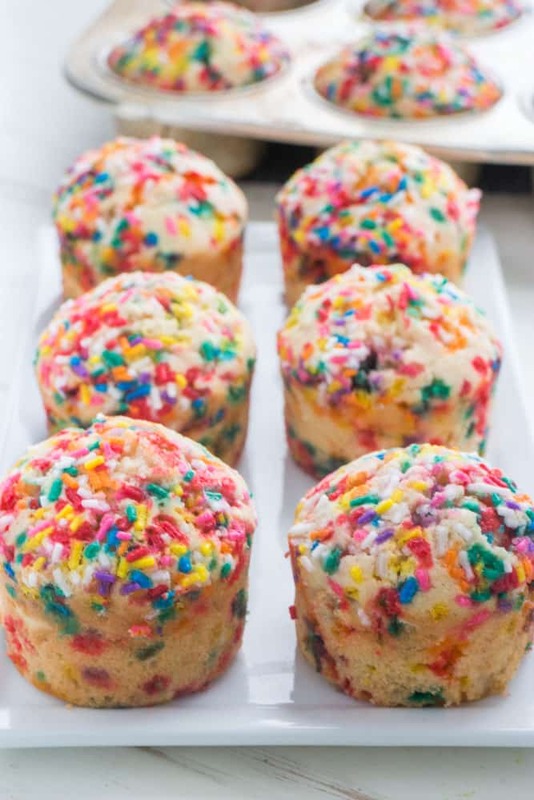 These Birthday Cake Muffins are super fluffy, just like a birthday cake – and they taste just like it too! 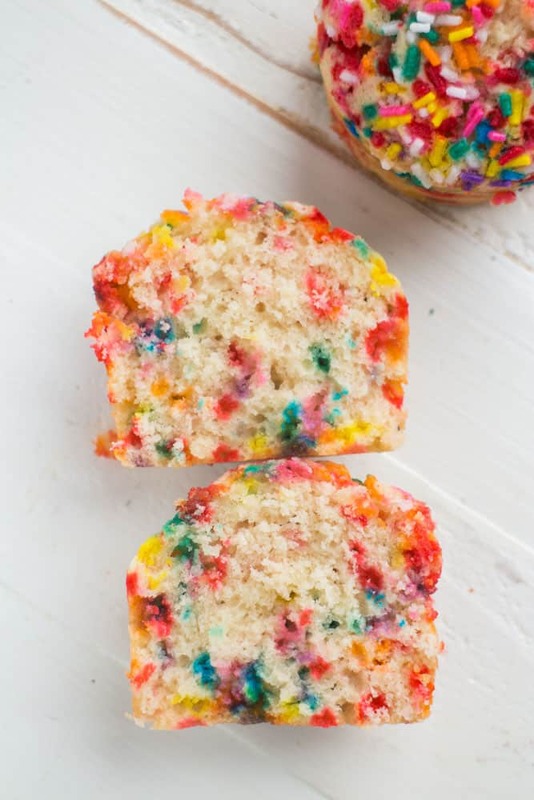 I include sprinkles inside the batter and then add additional sprinkles on top once in the muffin pan to give them a bright rainbow color all over! These would be perfect for a Birthday Celebration, but they would also be great for just adding some cheer to a breakfast or bringing a snack gift to leave in the kitchen at work. Don’t they look beautiful inside too? 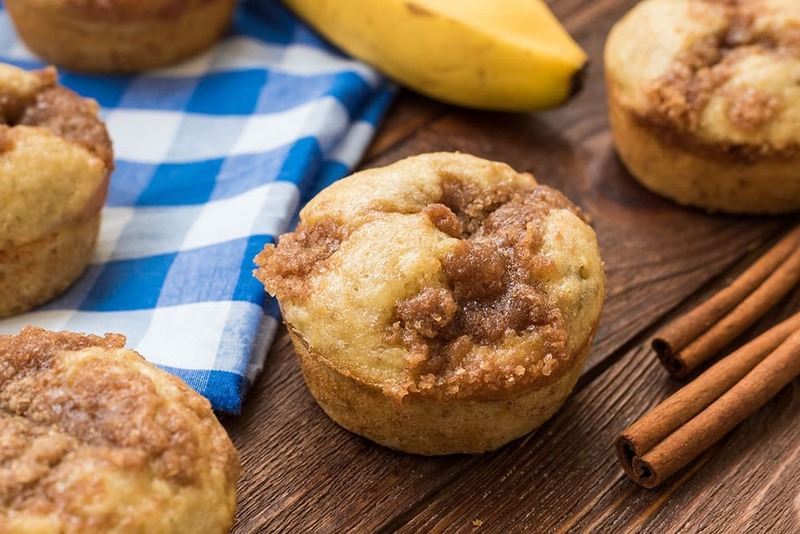 Are you looking for more muffin recipes? 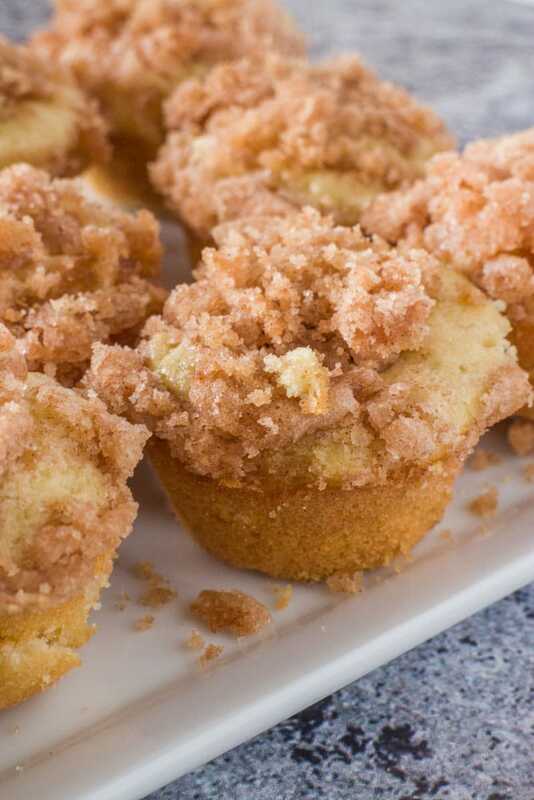 Then try some of my most popular muffins! In a bowl stir together flour, sugar, baking powder and salt. Add in 1 cup of rainbow sprinkles and gently mix with spoon to equally distribute them. Bake for 14-15 minutes or until slightly browned on the sides. OHHH MAN! You did this just to tease me now DIDN’T YOU! SPRINKLES, especially rainbow sprinkles were my HANDS DOWN FAVORITE THING EVER – I don’t know what it is, but rainbow sprinkles just make me drool! LOL! Love these happy happy birthday cake muffins Pamela!! so colorful…..Have a great week-end. 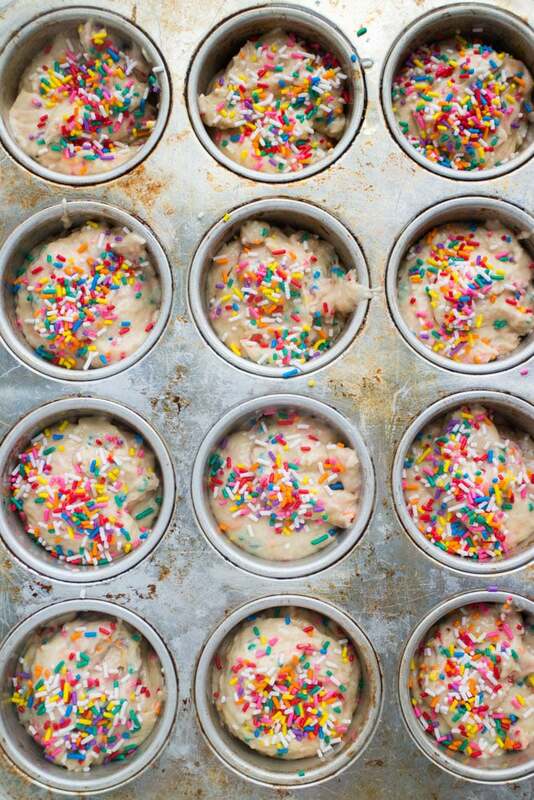 Oh my I love these cupcakes/muffins whatever you call them they look fabulous. All the yes for these little beauties. These muffins are really living their best life huh? So much pretty! I can’t wait to make some. What a colourful and fun treat! These are the muffins of my soul. YES! I adore these sprinkles!! They make me feel happy – I can’ t wait to make these! Oh my goodness, how gorgeous and festive are these muffins?? This is the best excuse EVER to eat birthday cake for breakfast! Oh my god! My niece would LOVE these cupcakes. I am going to have to make them for her birthday. Let’s call ’em muffakes and get to enjoying these – these are so fun, Pamela! I do like a happy muffin. how fun are these!? they’d be perfect for a birthday breakfast. thanks for linking up with our Merry Monday party! I would have a hard time not eating all of these! Yum! 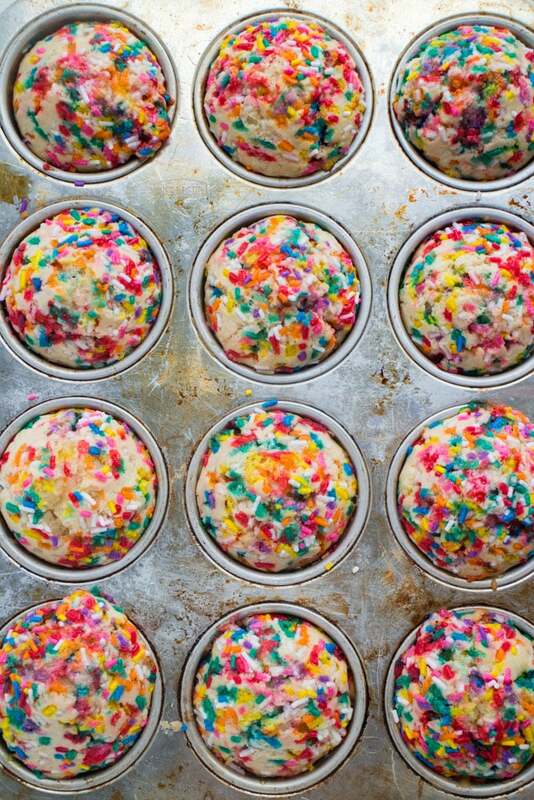 Such colorful and happy-looking muffins! Beautiful! These are so cute and fun! Thanks for linkin’ up with What’s Cookin’ Wednesday! i would NOT be disappointed to celebrate any occasion with these! These look so fun and delicious! Thanks for sharing with the Delicious Dishes Recipe Party this week! I just made these!! They are good! Light, fluffy. Very cute. My boys will be happy to see these when they get home this afternoon! Thank you for this great recipe! Hey Nicole, thanks for letting me know you made these muffins! You are the #1 Mom for surprising your boys with these! Enjoy! My daughters preschool has a no cupcake policy for birthdays so I’m wondering if I can get away with these lol, what makes them muffins and not cake? I think you definitely could Janet. For me the real defining difference is frosting which these muffins don’t have. Hope everyone enjoys them at preschool! Yes they do. Throw them on a baking sheet in the freezer for about 2 hours, and then put them in a freezer bag in the freezer. To eat, I like to microwave them for about 15 seconds. Enjoy! So happy to hear! Thanks for commenting and letting me know! I love these, so fun and colourful! How fun are these, my grandchildren would love these muffins. These would be great for a cold, wet week-end which will upon us shortly. I would love for you to share your posts on my Sunday’s Best linkup. We’re always looking for great recipes, especially kid funny recipes. We’re live, and start every Saturday at 8:00 PM EST. I absolutely love this recipe. I made it a few months ago and it was fantastic! It had the perfect amount of sweetness to it. Not too much! 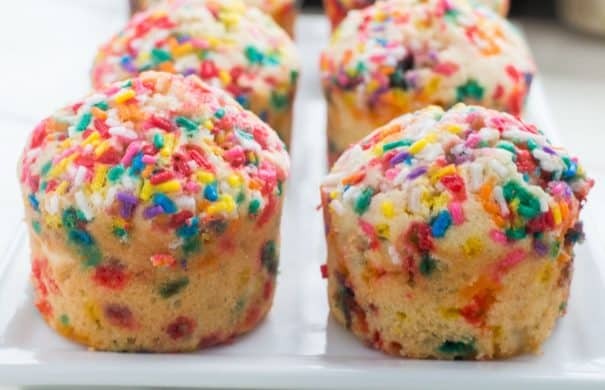 I wonder…instead of making individual muffin cakes, do you think this recipe could be used to make an actual round birthday cake? Hey Christine! Thanks for commenting, I’m so happy you liked these Birthday Cake Muffins! I haven’t tried this recipe to make a cake so I can’t be 100% sure, but I’d be interested in hearing how it turns out if you give it a shot! Hello, Thank you so much for these! I am having a morning birthday play date for my daughter turning 2! Question: was this for 12 mini muffins or are they regular sized ones? Hey Tabitha, this makes 12 regular sized muffins. Happy Birthday to your daughter! Made my son happy! He loved them and so did I. Would make again and again. Thank you! These look so good! I pinned them for my daughter’s upcoming birthday! Pinning this cute and colorful idea! Visiting from Friday at the Fire Station and I followed you on Pinterest and Facebook! These would brighten up any occasion! Thanks for joining us again at Celebrate Your Story, have a great weekend. 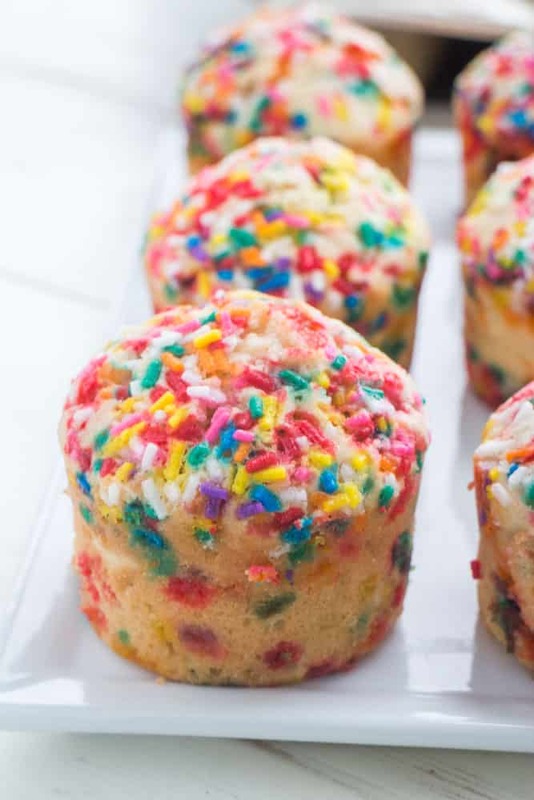 Cute Birthday Cake muffins! I have never heard of this idea before and I love it! Totally going to try. Also, beautiful food photography. These are so very cute and colorful! They would be perfect for a birthday party! I pinned this recipe! I hope to try them out because I love confetti! OMG this is so much fun! I’m a big kid and love pretty much anything with sprinkles. Thanks so much for sharing at the #happynowlinkup! These are so very tempting! I could bite into one right now. These look so fun and yummy! I love Sprinkles!!! Birthdays should always involve sprinkles! These look so pretty. I am sure they are delicious! Thanks for sharing, Pamela. We had a snow day today and we made these for our (almost!) 7 year old. We had no eggs (how on earth did that happen?!?) and ended up blending 3/4 cup of cottage cheese to replace them and the oil. They turned out amazingly delicious!!!! Definitely will be making them again! Thanks so much! You don’t have to be a kid to LOVE these Pamela. I’ve pinned this recipe for the big kids in my life. 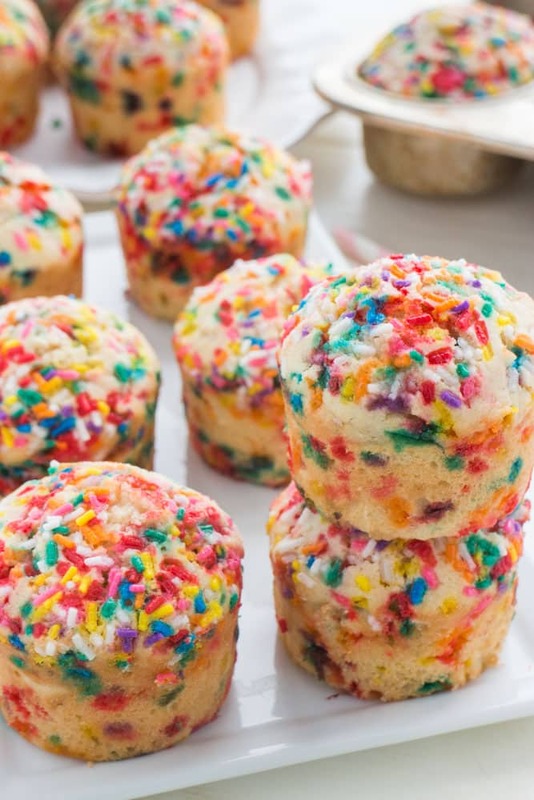 Those birthday cake muffins are so fun! My kids would be over the moon for these! I am saving this for a special treat. Thank you for bringing your yummy and festive treats to Fiesta Friday! I just made these for my daughter’s 3rd birthday, to bring into school. I wanted something fun but not with a ton of icing 🙂 These are delicious! I actually doubled the recipe and added 1 cup of Fage 2% yogurt for added moistness. It made 24 regular sized muffins plus about 15-16 mini muffins! Delicious. Thank you for this recipe! I am curious if you’d made this into a chocolate recipe? and if so, did you just add X amout of cocoa? Thanks! Hey Kerry, OOOOO I love the idea of adding yogurt for a more moist muffin! YUM! This is my favorite chocolate chip muffin recipe: https://brooklynfarmgirl.com/2014/02/16/fluffy-chocolate-chip-muffins/ – hope you give them a try! Thanks for commenting! Just took them out of the oven. They look perfect! Can not wait to dig in! Hey Chloe, this makes me so happy to hear! Dig in and enjoy! Do you know temp and time if I want to make mini miffins? Aw! How adorable and FUN! They look moist and yummy, I’ll have to save the post to try them the next time I am making treats with the kiddos. Thanks for the share! This is right up my kid’s alley. We are going to have to make these. Pinned! Great job and thanks for sharing on To Grandma’s House We Go! I made these. Very easy recipe but not a a ton of flavor. Any suggestions? You think I could try this with chocolate chips too? yes! I even think we could add almond extract to the recipe too! Enjoy these muffins Michelle! I just made them for my daughter’s birthday today! Looking forward to making these. Is there an option to print the recipe? Hey Lorraine, there is a print button on the recipe card. Let me know if you can’t find it!